The coupling of the uptake-utilization system can be further elucidated by outlining the oxygen cascade, figure 2, which links the lung to the muscle through the blood i.e. the respiratory, circulatory and metabolic systems. Figure 2. 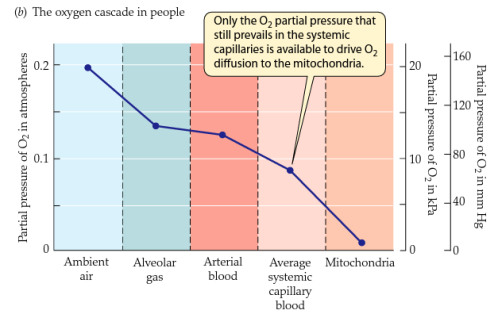 Oxygen pressure profile from the environment to the mitochondrion. This paper will try to shed some light on oxygen uptake kinetics, describing the various components of uptake and how oxygen kinetics are influenced by various intensities of exercise. Also, the various mechanisms of oxygen uptake as well as differences in different populations will be reviewed. The paper focuses on the training effect on oxygen uptake. 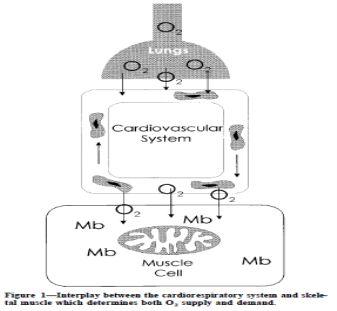 Oxygen uptake kinetics can be explained as all those processes involved in the taking of oxygen from the lung and delivering it to the mitochondrion where it is consumed by the working muscle. Figure 4 illustrates the various components of the uptake curve. VO2 kinetics for moderate exercise can be described as a monoexponetial curve with first order dynamics that rises to some steady state. Figure 4. VO2 uptake versus time. Understanding the link between lung, blood and tissues and how oxygen passes through each compartment, may provide some insight to improve diffusion, delivery and utilization fo oxygen to enhance performance. The uptake kinetics, once understood, may provide sports medicine scientists with a tool to help sick children, patients, and athletes to modify or enhance their performance. Analysis for the time course to steady state and the various factors which affect it can be correlated with various populations to help determine how these factors can be manipulated. Phases 1 and 2 can be considered to be dynamic whereas phase 3 to be steady state. This initial, immediate phase is called the cardio-dynamic phase as many researchesr (Whipp et al 82 and Sietsema 92) have noted that this phase is due to increased pulmonary blood flow rather than changes in arterio – venous difference. In this phase, mixed venous gas tensions have not changes and closely approximates the time required for metabolites released from the exercising muscles to reach the lungs (Whipp et al 82). The time course of this phase is between 15 – 20 seconds (Sietsema 92) and may show an abrupt response, from rest to work, or relatively slower response, from mild exercise to work (Whipp et al 82). This more gradual phase or rapid component is due to the changing kinetics of cellular metabolism and a further increase in pulmonary blood flow (Whipp et al 1980). This phase represents the slower exponential rise to steady state with a time course of 1.5 – 2 min (Linnarson 74) and a fall in the VCO2/VO2 ratio is an indicator for the beginning of phase 2 (Sietsema et al 86). 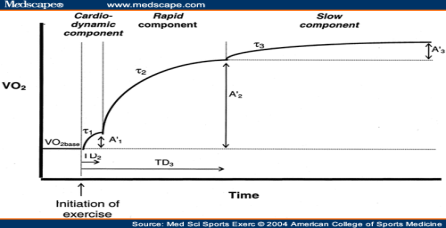 This phase represents the steady state or slow component where oxygen delivery equals oxygen utilization (Sietsema 92), also, Wasserman et al 1967, indicates that a true steady state is not achieved until the concentration of lactate becomes constant. The steady state is reached an about 3 min after the onset of exercise (Diamond et al 1977). Moderate is defined as being sub maximal or oxygen uptake less the anaerobic threshold (a VO2 above which there is sustained increase in blood lactate or carbon dioxide output secondary to bicarbonate buffing of lactic acid). In this intensity of exercise, VO2 rises to steady state by a monoexponential (first order) time course and VO2 steady state increases proportionally to the work rate (Whipp and Mahler 1980). This intensity is described as VO2 between the anaerobic threshold, AT, and VO2 max, figure 5. With work intensities above the AT, blood lactate begins to play a role in oxygen uptake kinetics making it more complicated, needing a slow and fast component to describe the response ( Whipp and Mahler 1980 and Whipp et al 1982), the dynamics of which could be described as second order (Linnarson 1974). Whipp and Mahler also indicate that the greater the increase in lactate, the larger is the proportionate contribution of the slower component, and that the time constant is prolonged at this intensity (Linnarson 1974). With heavy exercise and the production of lactate, VO2 continues to rise beyond 3 minutes, the VO2 drift as Casaburi et al 1987 calls it. Severe exercise allows high blood lactate from the anaerobic system to be reached until the exercise becomes unbearable (Whipp and Mahler 1980). Whipp 1972, shows that the time to steady state greatly increases with increasing work rates above the AT. It is a known fact that training improves body performance in some way. Endurance athletes also tend to have greater VO2 due to improved cardiac output and greater arterio-venous differences. Hickson et al 1978 reports a faster rate of VO2 to attaining steady state in the trained than in the untrained state. This indicates that trained individuals reach steady state faster than non trained individuals. Hickson et al also indicates that VO2 time course is determined not only by relative work but also by the level of training. Zhang et al 1991, also found that VO2 kinetics are slower in less fit subjects and Whipp and Wasserman also confirm that VO2 kinetics are faster in more fit individuals. Zhang et al. suggest that a faster kinetics may indicate that in fit subjects the aerobic ATP flux is greater that the anaerobic ATP flux. Casaburi et al 1987 and Yoshida 91, have shown that blood lactate levels can be decreased with endurance training and also suggest that lactate can be correlated to the delayed rise in VO2 (the Vo2 drift). The increase in muscle mitochondria with endurance training may be a factor in improving oxygen uptake kinetics. Biochemical adaptations that occur in the muscle, such as increased mitochondrion size, number and increased capacity for oxidation may increase oxygen uptake kinetics (Girandola 73) which plays a role in uptake kinetics. Berry 1985 indicates that there is an increased capillary density and fiber area with training which may improve oxygen kinetics. One point that Berry 1985 makes is that interval training and steady state training both decrease the time constant, but interval training was found to have a greater effect on the time constant. 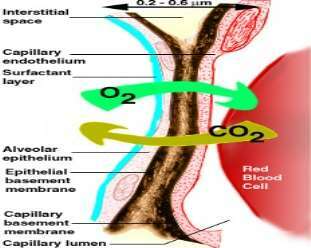 In conclusion, oxygen uptake kinetics describes the processes that occur at the lung, in the blood and in the muscle to ultimately oxidize fuels into water and carbon dioxide. These systems are intimately linked together and it is the job of sports medicine scientists to identify the various factors and limitations that govern VO2 kinetics. This paper reviews background information on oxygen uptake kinetics with focus on training effect on uptake. 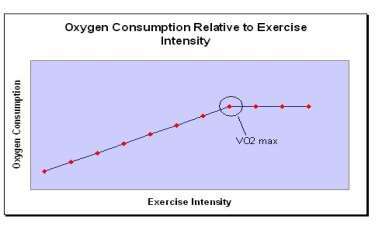 VO2 kinetics can be described for moderate intensity, constant load work, as a monoexponential curve to some steady state, the dynamic non steady state being referred to as Phase 1 and 2 while phase 3 being the steady state. The duration of each phase, and hence oxygen kinetics, is influenced by intensity of exercise (light, moderate or heavy) and the duration of exercise. The mechanisms that govern may be peripheral, those processes that involve uptake and utilization in the muscle, or central, those processes in the respiratory and circulatory compartment and everywhere else in the body. The creatine phosphate shuttle hypothesis is the closest to resemble the VO2 kinetics and may be a major player in the VO2 game. VO2 kinetics is seen to be slowed in cardiac and pulmonary disease patients and these individuals are overall limited in the exercise they can do. When prescribing exercise, VO2 kinetics analysis maybe helpful as an indicator of the “fitness “of the system and hence which sports are more suitable. Michail Tonkonogi,Brandon Walsh, Michael Svensson and Kent Sahlin. Mitochondrial function and antioxidative defence in human muscle: effects of endurance training and oxidative stress. The Journal of Physiology. Volume 528,Issue 2,pages 379–388,October 2000. "Oxygen Uptake Kinetics: Training Effect on Oxygen Uptake." UKEssays.com. 11 2018. All Answers Ltd. 04 2019 <https://www.ukessays.com/essays/physiology/oxygen-uptake-kinetics.php?vref=1>. "Oxygen Uptake Kinetics: Training Effect on Oxygen Uptake." All Answers Ltd. ukessays.com, November 2018. Web. 19 April 2019. <https://www.ukessays.com/essays/physiology/oxygen-uptake-kinetics.php?vref=1>. UKEssays. November 2018. Oxygen Uptake Kinetics: Training Effect on Oxygen Uptake. [online]. Available from: https://www.ukessays.com/essays/physiology/oxygen-uptake-kinetics.php?vref=1 [Accessed 19 April 2019]. UKEssays. Oxygen Uptake Kinetics: Training Effect on Oxygen Uptake [Internet]. November 2018. [Accessed 19 April 2019]; Available from: https://www.ukessays.com/essays/physiology/oxygen-uptake-kinetics.php?vref=1.